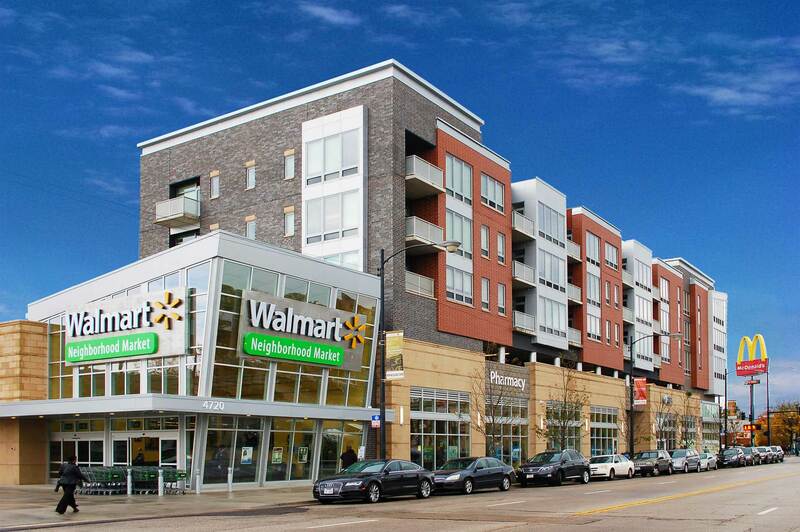 McShane Construction Company was selected to serve as the general contractor for The Shops and Lofts at 47, a mixed-use development located at E. 47th and S. Cottage Grove in Chicago, Illinois, on behalf of developers, The Community Builders, Skilken and Troy Enterprises. The 202,000-square-foot complex includes a 72-unit mixed-income housing component on the second through fifth floors, a parking garage for 72 vehicles on the second floor and 54,000 square feet of retail space, anchored by a Walmart Neighborhood Market on the ground level. McShane also completed the construction of three new residential flats and the rehabilitation of one existing residential flat providing 24 additional units. The development was designed and constructed to meet Chicago Green Homes and Green Roof standards. Select images courtesy of Pappageorge Haymes Partners.